Achilles tendon refers to a tendon that runs down the lower back of leg to the heel. Achilles tendon is used every time you walk, jump, run, or play sports. Without this tendon, you cannot move the feet or legs. Pulling or overusing the tenon results in injuries to the tendon, which causes swelling and severe pain. Lack of immediate attention to the condition could lead to Achilles tendinitis. It is caused by the degenerative change of the tendon thanks to repetitive trauma. Rehab is the usual treatment of Achilles tendinitis injury, which can promote the healing of the tendon and strengthen it at the same time. In Achilles tendinitis recovery, the pain and inflammation should be first controlled. Rest is the prerequisite in the tendon recovery. Achilles tendinitis is an injury that should be taken seriously. If it develops into chronic Achilles tendinitis, it will be much difficult to cure. Taping the affected tendon can help in the reduction of the stress on the tendon, thereby relieving pain. Strips of elastic tape should be put from the top calf and pass under the heel. This is especially essential during the early stages. Taking anti-inflammatory medication and painkillers is effective in relieving pain and reducing swelling on the affected tendon. This is an important part of Achilles tendinitis rehab. This is usually applied for 10-15 minutes, three times a day. If it is possible, you can apply every two hours until the severity of the symptoms reduces. You can use ice in a wet towel or cold gel packs. Ice should not be applied directly because it can cause ice burns. Place a heel cup to raise your heels for about a centimeter. This helps to relieve stress and pain on the affected tendon. Avoid leaving the heal pad there after you have recovered, as it may increase the strain on the Achilles tendon. Application of electrotherapy like ultrasound by a professional will help in the reduction of swelling and pain and provide micro massage on the affected tissues. Sports massage helps in the mobilization of tissues and relaxation of the calf muscles. Exercises also play an important role in better and faster Achilles tendinitis recovery. With your injured leg stretched out in front, sit on a hard surface. Loop a towel at the ball of the foot and around the toes. Pull it towards the body, keeping the leg straight. Hold the position for 15-30 seconds and repeat the exercise 3 times. Stand and raise with your hands at the eye level while facing a wall. Keep the injured leg back with the heel on the floor. Bend the other knee and keep it forward. 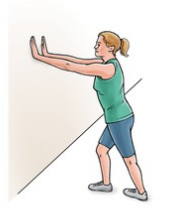 Slowly lean towards the wall, turn the injured foot slightly inward in the pigeon-toed position until you feel the stretch at the back of the calf. Hold on to the stretch for 30 seconds and repeat the exercise several times a day. While lying on the uninjured side, tighten your front thigh muscles on the injured leg and lift it 8-10 inches away from the uninjured leg. Keep your leg straight and then lower it slowly. Repeat the exercise 30 times and do it in two sets for Achilles tendinitis rehab. Stand with your injured leg on a support about 3-5 inches high. 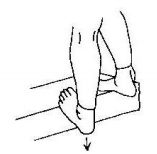 Keep the uninjured foot flat on the floor and then shift your weight into the injured leg. 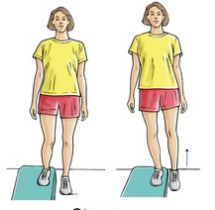 Straighten the injured leg while the other uninjured leg comes off the floor surface. Return to the original position by bending the injured leg and slowly lowering the uninjured leg back to the floor. Repeat the exercise 15 times in two sets. 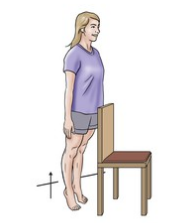 With your feet flat on the floor, stand behind a counter or chair. Use the counter or chair for support as you raise your body up on your toes and hold the position for 5 seconds. Slowly lower your body using the injured leg, you can hold onto the support if necessary. Repeat 15 times in two sets and you can rest in between sets. Stand with ball of the injured foot on a step. Try to reach the bottom of the step with the heel until a stretch is felt on the foot arch. Hold onto this position for 30 seconds and repeat the exercise three times. While standing with your normal position, rock the back of the heels to allow the toes to move up from the ground. Hold onto this position for 5 seconds. Repeat the exercise 10 times in three sets.